The pond at Painshill Park on a February day. This is where Arnold liked to skate in winter. Arnold's death followed not very long after little Geist's. 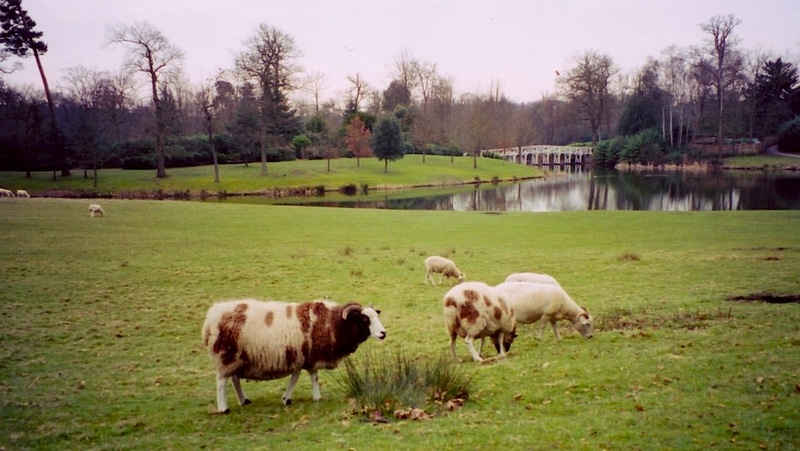 When he went skating on Painshill Lake in January 1886, he mentioned in a letter to his sister, "Pains Hill Lake in snow and ice was as beautiful as ever. I got on very well, and the skating did not bring on the chest pain" (LL 6: 112). Nicholas Murray, in his biography of Matthew Arnold, firmly rejects the "myth" that Arnold grew melancholy in later life: "There was no slackening of his animation and joy in living" (334), he says. But Arnold had had been having this kind of pain for around eight months, and knew exactly what it meant, since his grandfather as well as his father had died in middle age. So although he was still in his 60s, he did try to school himself to think of death as "a quite natural event" (LL VI: 256). And indeed, a couple of years after mentioning the chest pain, he had a fatal heart attack while hurrying for a tram in Liverpool. He and his wife were going to meet their daughter Lucy, who was coming home to have her second baby. His death was put down as much to his eager anticipation as to the exertion. The Arnold family plot at All Saints', Laleham. 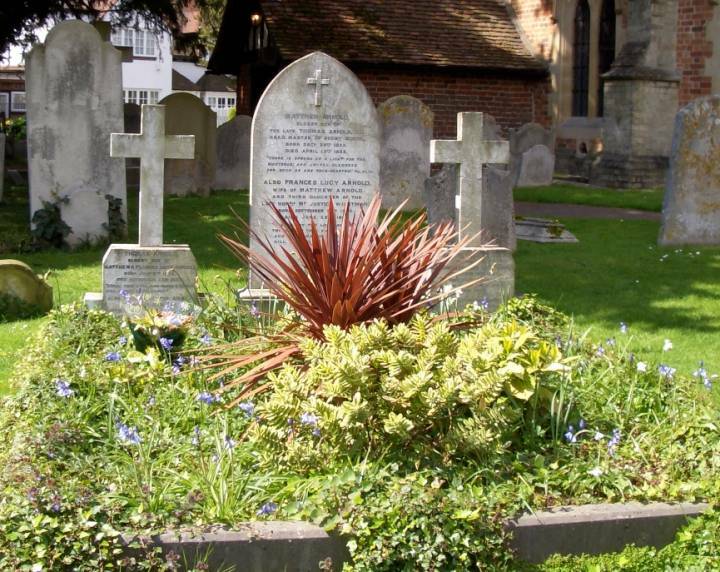 Matthew Arnold was buried on the beautiful, rather changeable spring day of 18 April 1888, in the family plot at Laleham. The people of both Cobham and Laleham had been proud of their connection with him, and villagers came out along the route to pay their last respects to him. Arnold would no doubt have been touched. But the great and the good of his day also attended his funeral, among them Robert Browning and Henry James — down to see him at last, and without his friend's urging. Indeed, as Lord Coleridge's son noted, "Never before or since has there been gathered together in that little church such a concourse of famous men as met there to pay the last tribute of honour and affection to this universally beloved man of genius" (qtd. in Murray 350). Archdeacon Farrar, an long-time friend who came down from Westminster to officiate, was, like many in the congregation at this very simple service, almost overcome with grief. Within the next few years, both Browning and Tennyson, who were much senior to him, would die too. It was the end of the great era of Victorian poetry. The two older poets were buried in Westminster Abbey, and Arnold too would be remembered there by a lifelike bust by Albert Bruce-Joy, and a memorial tablet (he is the only person to have two memorials at the Abbey). There would be a memorial plaque at St Andrew's, Cobham, too. But the quiet spot under the trees at Laleham was unquestionably the right resting place for him. Sadly, he was soon joined there by his daughter Lucy's new baby, who died within hours of his birth, about two months after her traumatic homecoming. 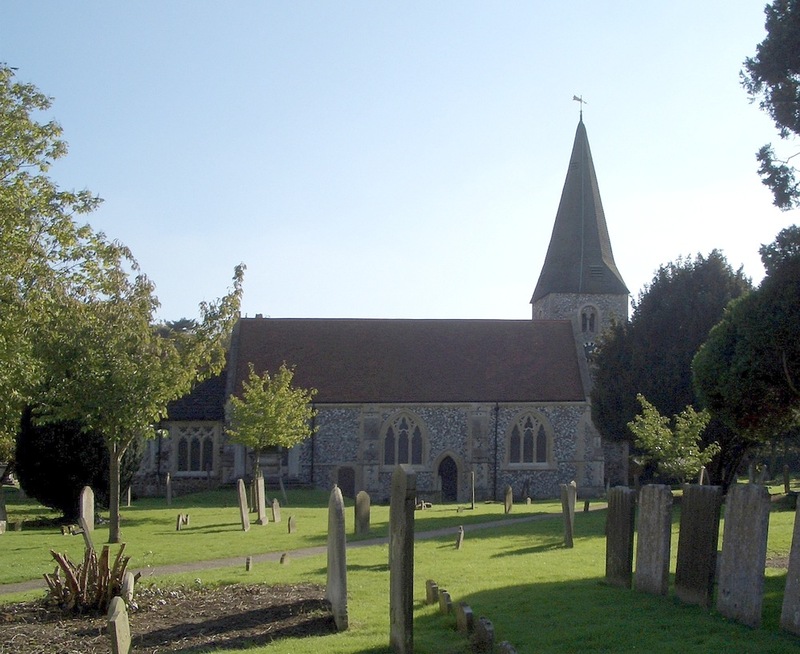 Left: The parish church of St Andrew's, Cobham, where the Arnolds were well known: their daughter Lucy had been married there in 1884. Right: Arnold's memorial plaque in the church, put up by his friends the Ellesmeres. How do we respond to Arnold now? Like anyone else, he had had his foibles. For example, as shown in the caricature by Tissot, he was known even in his own times to be a bit of a dandy. But his life had been busy, productive and so blameless that his loved ones found nothing to censor in his letters but private endearments (he addressed Flu as "my extreme darling") and high spirits. Printed in full at last, his correspondence now fully discloses the engaging personality of this self-avowed "Surrey man" whose writings emphasised and exemplified the value of studying the humanities, and made us appreciate anew the very meaning of that term. As for his critical stance, the Times leader of 19 April 1888 called Arnold "a guide, a representative, a glory" (9) and bewailed the fact that he had not been given any honours. But he has had his detractors — notably T. S. Eliot, who felt that by promoting "Culture in the place of Religion" (436) Arnold had helped to father "the gospel of Pater" (436). But, as F. B. Pinion and many others have pointed out, such had been Arnold's legacy that Eliot himself owed much to him (273). Those who are still enthusiastic about Arnold's contributions to poetry and literary scholarship, and appreciate his thinking about society at large, need look no further for support than Adam Kirsch's defence of him. Kirsch finds in his ideas, as well as in his poetry, an honest, moderate, compassionate and mature response to a difficult age of transition (see 72-73). This is all of a piece with the personality seen in Arnold's familiar letters, and will perhaps stand as the ultimate verdict on him. Arnold, Matthew. The Letters of Matthew Arnold (cited as LL). Ed. Cecil Y. Lang. 6 vols. Charlottesville and London: University of Virginia Press, 1996-2001. Eliot, T. S. "Arnold and Pater." Selected Essays. London: Faber, 1951. 431-43. Kirsch, Adam. "Matthew Arnold and T. S. Eliot" The American Scholar. 67/3 (1998). Accessed via Jstor. 65–73. Web. 7 May 2017. Murray, Nicholas. A Life of Matthew Arnold. London: Sceptre, 1996. Pinion, F. B. The T. S. Eliot Companion: Life and Works. Basingstoke: Palgrave Macmillan, 1986. 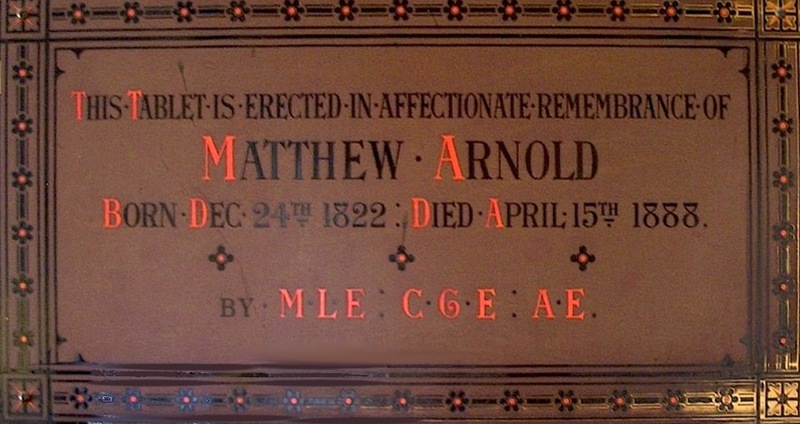 "Thomas and Matthew Arnold." Westminster Abbey (this shows both the monuments to him, as well as the bust of his father). Web. 7 May 2017. "The whole educated intelligence of England." The Times.19 April 1888: 9. Times Digitl Archive. Web. 7 May 2017.